Easily scale and monitor your training curriculum with our Professional Driver Transcripts. Simulation Training is the most advanced experience you can bring to your drivers. Having trained over 110,000 drivers, we have been able to identify key factors of driver’s behavior to help you identify strengths and weaknesses of your operating fleet. Schedule drivers for training in your curriculum. Identify key risk factors that may put your drivers at a higher risk. Identify Strengths of your drivers to put them in the most qualified position. Focus your training time with recommended skills training. 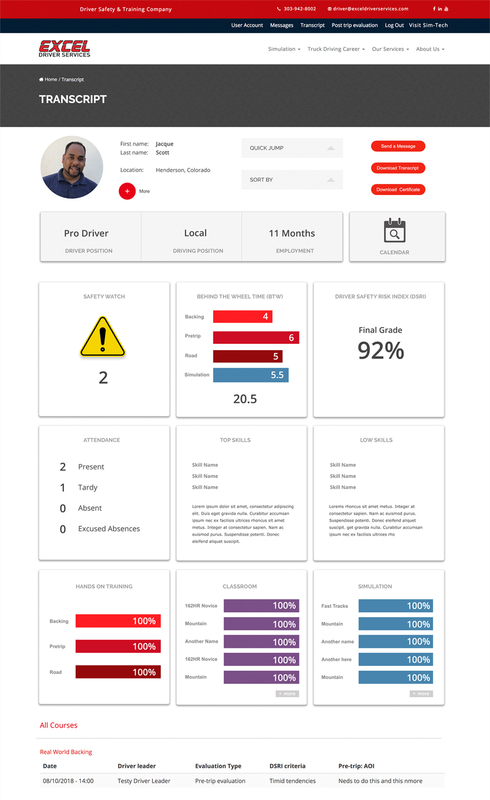 Get snapshots and progression of drivers throughout their training experience. Certificates & Scanned Copies for Downloadable Documents. Organized Training Reports Into a Single View. Individual User Records All One One Site.